The four basic categories of molecules for building life are carbohydrates, lipids, proteins, and nucleic acids. Carbohydrates serve many purposes, from energy to structure to chemical communication, as monomers or polymers. Lipids, which are hydrophobic, also have different purposes, including energy storage, structure, and signaling. Proteins, made of amino acids in up to four structural levels, are involved in just about every process of life. 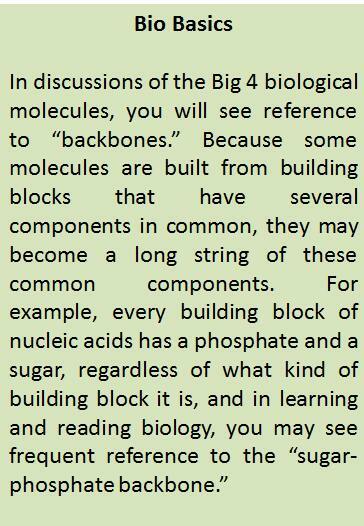 The nucleic acids DNA and RNA consist of four nucleotide building blocks, and each has different purposes. Life is so diverse and unwieldy, it may surprise you to learn that we can break it down into four basic categories of molecules. Possibly even more implausible is the fact that two of these categories of large molecules themselves break down into a surprisingly small number of building blocks. The proteins that make up all of the living things on this planet and ensure their appropriate structure and smooth function consist of only 20 different kinds of building blocks. Nucleic acids, specifically DNA, are even more basic: only four different kinds of molecules provide the materials to build the countless different genetic codes that translate into all the different walking, swimming, crawling, oozing, and/or photosynthesizing organisms that populate the third rock from the Sun. The functional groups, assembled into building blocks on backbones of carbon atoms, can be bonded together to yield large molecules that we classify into four basic categories. These molecules, in many different permutations, are the basis for the diversity that we see among living things. They can consist of thousands of atoms, but only a handful of different kinds of atoms form them. It’s like building apartment buildings using a small selection of different materials: bricks, mortar, iron, glass, and wood. Arranged in different ways, these few materials can yield a huge variety of structures. We encountered functional groups and the SPHONC in Chapter 3. These components form the four categories of molecules of life. These Big Four biological molecules are carbohydrates, lipids, proteins, and nucleic acids. They can have many roles, from giving an organism structure to being involved in one of the millions of processes of living. Let’s meet each category individually and discover the basic roles of each in the structure and function of life. You have met carbohydrates before, whether you know it or not. We refer to them casually as “sugars,” molecules made of carbon, hydrogen, and oxygen. A sugar molecule has a carbon backbone, usually five or six carbons in the ones we’ll discuss here, but it can be as few as three. Sugar molecules can link together in pairs or in chains or branching “trees,” either for structure or energy storage. When you look on a nutrition label, you’ll see reference to “sugars.” That term includes carbohydrates that provide energy, which we get from breaking the chemical bonds in a sugar called glucose. The “sugars” on a nutrition label also include those that give structure to a plant, which we call fiber. Both are important nutrients for people. Sugars serve many purposes. They give crunch to the cell walls of a plant or the exoskeleton of a beetle and chemical energy to the marathon runner. When attached to other molecules, like proteins or fats, they aid in communication between cells. But before we get any further into their uses, let’s talk structure. 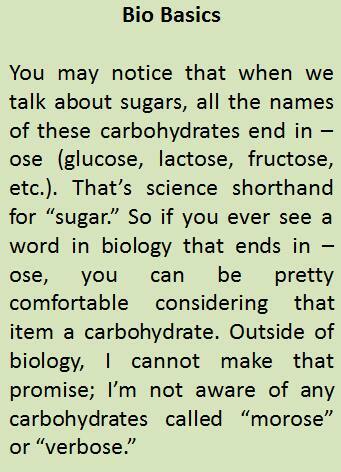 The sugars we encounter most in basic biology have their five or six carbons linked together in a ring. There’s no need to dive deep into organic chemistry, but there are a couple of essential things to know to interpret the standard representations of these molecules. Check out the sugars depicted in the figure. The top-left molecule, glucose, has six carbons, which have been numbered. The sugar to its right is the same glucose, with all but one “C” removed. The other five carbons are still there but are inferred using the conventions of organic chemistry: Anywhere there is a corner, there’s a carbon unless otherwise indicated. It might be a good exercise for you to add in a “C” over each corner so that you gain a good understanding of this convention. You should end up adding in five carbon symbols; the sixth is already given because that is conventionally included when it occurs outside of the ring. On the left is a glucose with all of its carbons indicated. They’re also numbered, which is important to understand now for information that comes later. On the right is the same molecule, glucose, without the carbons indicated (except for the sixth one). Wherever there is a corner, there is a carbon, unless otherwise indicated (as with the oxygen). On the bottom left is ribose, the sugar found in RNA. The sugar on the bottom right is deoxyribose. Note that at carbon 2 (*), the ribose and deoxyribose differ by a single oxygen. The lower left sugar in the figure is a ribose. In this depiction, the carbons, except the one outside of the ring, have not been drawn in, and they are not numbered. This is the standard way sugars are presented in texts. Can you tell how many carbons there are in this sugar? Count the corners and don’t forget the one that’s already indicated! If you said “five,” you are right. Ribose is a pentose (pent = five) and happens to be the sugar present in ribonucleic acid, or RNA. Think to yourself what the sugar might be in deoxyribonucleic acid, or DNA. If you thought, deoxyribose, you’d be right. The fourth sugar given in the figure is a deoxyribose. In organic chemistry, it’s not enough to know that corners indicate carbons. Each carbon also has a specific number, which becomes important in discussions of nucleic acids. Luckily, we get to keep our carbon counting pretty simple in basic biology. To count carbons, you start with the carbon to the right of the non-carbon corner of the molecule. The deoxyribose or ribose always looks to me like a little cupcake with a cherry on top. The “cherry” is an oxygen. To the right of that oxygen, we start counting carbons, so that corner to the right of the “cherry” is the first carbon. Now, keep counting. Here’s a little test: What is hanging down from carbon 2 of the deoxyribose? If you said a hydrogen (H), you are right! Now, compare the deoxyribose to the ribose. Do you see the difference in what hangs off of the carbon 2 of each sugar? You’ll see that the carbon 2 of ribose has an –OH, rather than an H. The reason the deoxyribose is called that is because the O on the second carbon of the ribose has been removed, leaving a “deoxyed” ribose. This tiny distinction between the sugars used in DNA and RNA is significant enough in biology that we use it to distinguish the two nucleic acids. In fact, these subtle differences in sugars mean big differences for many biological molecules. 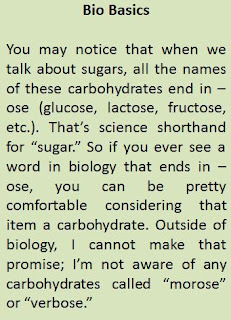 Below, you’ll find a couple of ways that apparently small changes in a sugar molecule can mean big changes in what it does. These little changes make the difference between a delicious sugar cookie and the crunchy exoskeleton of a dung beetle. A marathon runner keeps fuel on hand in the form of “carbs,” or sugars. These fuels provide the marathoner’s straining body with the energy it needs to keep the muscles pumping. When we take in sugar like this, it often comes in the form of glucose molecules attached together in a polymer called starch. We are especially equipped to start breaking off individual glucose molecules the minute we start chewing on a starch. Double X Extra: A monomer is a building block (mono = one) and a polymer is a chain of monomers. With a few dozen monomers or building blocks, we get millions of different polymers. That may sound nutty until you think of the infinity of values that can be built using only the numbers 0 through 9 as building blocks or the intricate programming that is done using only a binary code of zeros and ones in different combinations. Our bodies then can rapidly take the single molecules, or monomers, into cells and crack open the chemical bonds to transform the energy for use. The bonds of a sugar are packed with chemical energy that we capture to build a different kind of energy-containing molecule that our muscles access easily. Most species rely on this process of capturing energy from sugars and transforming it for specific purposes. Plants use the Sun’s energy to make their own glucose, and starch is actually a plant’s way of storing up that sugar. Potatoes, for example, are quite good at packing away tons of glucose molecules and are known to dieticians as a “starchy” vegetable. The glucose molecules in starch are packed fairly closely together. A string of sugar molecules bonded together through dehydration synthesis, as they are in starch, is a polymer called a polysaccharide (poly = many; saccharide = sugar). When the monomers of the polysaccharide are released, as when our bodies break them up, the reaction that releases them is called hydrolysis. Double X Extra: The specific reaction that hooks one monomer to another in a covalent bond is called dehydration synthesis because in making the bond--synthesizing the larger molecule--a molecule of water is removed (dehydration). The reverse is hydrolysis (hydro = water; lysis = breaking), which breaks the covalent bond by the addition of a molecule of water. Although plants make their own glucose and animals acquire it by eating the plants, animals can also package away the glucose they eat for later use. Animals, including humans, store glucose in a polysaccharide called glycogen, which is more branched than starch. In us, we build this energy reserve primarily in the liver and access it when our glucose levels drop. Whether starch or glycogen, the glucose molecules that are stored are bonded together so that all of the molecules are oriented the same way. If you view the sixth carbon of the glucose to be a “carbon flag,” you’ll see in the figure that all of the glucose molecules in starch are oriented with their carbon flags on the upper left. The orientation of monomers of glucose in polysaccharides can make a big difference in the use of the polymer. The glucoses in the molecule on the top are all oriented “up” and form starch. The glucoses in the molecule on the bottom alternate orientation to form cellulose, which is quite different in its function from starch. Storing up sugars for fuel and using them as fuel isn’t the end of the uses of sugar. In fact, sugars serve as structural molecules in a huge variety of organisms, including fungi, bacteria, plants, and insects. The primary structural role of a sugar is as a component of the cell wall, giving the organism support against gravity. In plants, the familiar old glucose molecule serves as one building block of the plant cell wall, but with a catch: The molecules are oriented in an alternating up-down fashion. The resulting structural sugar is called cellulose. That simple difference in orientation means the difference between a polysaccharide as fuel for us and a polysaccharide as structure. Insects take it step further with the polysaccharide that makes up their exoskeleton, or outer shell. Once again, the building block is glucose, arranged as it is in cellulose, in an alternating conformation. But in insects, each glucose has a little extra added on, a chemical group called an N-acetyl group. This addition of a single functional group alters the use of cellulose and turns it into a structural molecule that gives bugs that special crunchy sound when you accidentally...ahem...step on them. These variations on the simple theme of a basic carbon-ring-as-building-block occur again and again in biological systems. In addition to serving roles in structure and as fuel, sugars also play a role in function. The attachment of subtly different sugar molecules to a protein or a lipid is one way cells communicate chemically with one another in refined, regulated interactions. It’s as though the cells talk with each other using a specialized, sugar-based vocabulary. Typically, cells display these sugary messages to the outside world, making them available to other cells that can recognize the molecular language. Starch makes for good, accessible fuel, something that we immediately attack chemically and break up for quick energy. But fats are energy that we are supposed to bank away for a good long time and break out in times of deprivation. Like sugars, fats serve several purposes, including as a dense source of energy and as a universal structural component of cell membranes everywhere. Turn again to a nutrition label, and you’ll see a few references to fats, also known as lipids. (Fats are slightly less confusing that sugars in that they have only two names.) The label may break down fats into categories, including trans fats, saturated fats, unsaturated fats, and cholesterol. You may have learned that trans fats are “bad” and that there is good cholesterol and bad cholesterol, but what does it all mean? Let’s start with what we mean when we say saturated fat. The question is, saturated with what? There is a specific kind of dietary fat call the triglyceride. As its name implies, it has a structural motif in which something is repeated three times. That something is a chain of carbons and hydrogens, hanging off in triplicate from a head made of glycerol, as the figure shows. Those three carbon-hydrogen chains, or fatty acids, are the “tri” in a triglyceride. Chains like this can be many carbons long. Double X Extra: We call a fatty acid a fatty acid because it’s got a carboxylic acid attached to a fatty tail. A triglyceride consists of three of these fatty acids attached to a molecule called glycerol. Our dietary fat primarily consists of these triglycerides. Triglycerides come in several forms. You may recall that carbon can form several different kinds of bonds, including single bonds, as with hydrogen, and double bonds, as with itself. A chain of carbon and hydrogens can have every single available carbon bond taken by a hydrogen in single covalent bond. This scenario of hydrogen saturation yields a saturated fat. The fat is saturated to its fullest with every covalent bond taken by hydrogens single bonded to the carbons. Saturated fats have predictable characteristics. They lie flat easily and stick to each other, meaning that at room temperature, they form a dense solid. You will realize this if you find a little bit of fat on you to pinch. Does it feel pretty solid? That’s because animal fat is saturated fat. The fat on a steak is also solid at room temperature, and in fact, it takes a pretty high heat to loosen it up enough to become liquid. Animals are not the only organisms that produce saturated fat--avocados and coconuts also are known for their saturated fat content. The top graphic above depicts a triglyceride with the glycerol, acid, and three hydrocarbon tails. The tails of this saturated fat, with every possible hydrogen space occupied, lie comparatively flat on one another, and this kind of fat is solid at room temperature. The fat on the bottom, however, is unsaturated, with bends or kinks wherever two carbons have double bonded, booting a couple of hydrogens and making this fat unsaturated, or lacking some hydrogens. Because of the space between the bumps, this fat is probably not solid at room temperature, but liquid. You can probably now guess what an unsaturated fat is--one that has one or more hydrogens missing. Instead of single bonding with hydrogens at every available space, two or more carbons in an unsaturated fat chain will form a double bond with carbon, leaving no space for a hydrogen. Because some carbons in the chain share two pairs of electrons, they physically draw closer to one another than they do in a single bond. This tighter bonding result in a “kink” in the fatty acid chain. In a fat with these kinks, the three fatty acids don’t lie as densely packed with each other as they do in a saturated fat. The kinks leave spaces between them. Thus, unsaturated fats are less dense than saturated fats and often will be liquid at room temperature. A good example of a liquid unsaturated fat at room temperature is canola oil. A few decades ago, food scientists discovered that unsaturated fats could be resaturated or hydrogenated to behave more like saturated fats and have a longer shelf life. The process of hydrogenation--adding in hydrogens--yields trans fat. This kind of processed fat is now frowned upon and is being removed from many foods because of its associations with adverse health effects. If you check a food label and it lists among the ingredients “partially hydrogenated” oils, that can mean that the food contains trans fat. Double X Extra: A triglyceride can have up to three different fatty acids attached to it. Canola oil, for example, consists primarily of oleic acid, linoleic acid, and linolenic acid, all of which are unsaturated fatty acids with 18 carbons in their chains. Why do we take in fat anyway? Fat is a necessary nutrient for everything from our nervous systems to our circulatory health. It also, under appropriate conditions, is an excellent way to store up densely packaged energy for the times when stores are running low. We really can’t live very well without it. You may have heard that oil and water don’t mix, and indeed, it is something you can observe for yourself. Drop a pat of butter--pure saturated fat--into a bowl of water and watch it just sit there. Even if you try mixing it with a spoon, it will just sit there. Now, drop a spoon of salt into the water and stir it a bit. The salt seems to vanish. You’ve just illustrated the difference between a water-fearing (hydrophobic) and a water-loving (hydrophilic) substance. Generally speaking, compounds that have an unequal sharing of electrons (like ions or anything with a covalent bond between oxygen and hydrogen or nitrogen and hydrogen) will be hydrophilic. 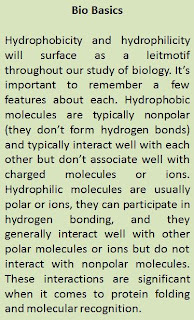 The reason is that a charge or an unequal electron sharing gives the molecule polarity that allows it to interact with water through hydrogen bonds. A fat, however, consists largely of hydrogen and carbon in those long chains. Carbon and hydrogen have roughly equivalent electronegativities, and their electron-sharing relationship is relatively nonpolar. Fat, lacking in polarity, doesn’t interact with water. As the butter demonstrated, it just sits there. There is one exception to that little maxim about fat and water, and that exception is the phospholipid. This lipid has a special structure that makes it just right for the job it does: forming the membranes of cells. A phospholipid consists of a polar phosphate head--P and O don’t share equally--and a couple of nonpolar hydrocarbon tails, as the figure shows. If you look at the figure, you’ll see that one of the two tails has a little kick in it, thanks to a double bond between the two carbons there. Phospholipids form a double layer and are the major structural components of cell membranes. Their bend, or kick, in one of the hydrocarbon tails helps ensure fluidity of the cell membrane. The molecules are bipolar, with hydrophilic heads for interacting with the internal and external watery environments of the cell and hydrophobic tails that help cell membranes behave as general security guards. The kick and the bipolar (hydrophobic and hydrophilic) nature of the phospholipid make it the perfect molecule for building a cell membrane. A cell needs a watery outside to survive. It also needs a watery inside to survive. Thus, it must face the inside and outside worlds with something that interacts well with water. But it also must protect itself against unwanted intruders, providing a barrier that keeps unwanted things out and keeps necessary molecules in. Phospholipids achieve it all. They assemble into a double layer around a cell but orient to allow interaction with the watery external and internal environments. On the layer facing the inside of the cell, the phospholipids orient their polar, hydrophilic heads to the watery inner environment and their tails away from it. On the layer to the outside of the cell, they do the same. As the figure shows, the result is a double layer of phospholipids with each layer facing a polar, hydrophilic head to the watery environments. The tails of each layer face one another. They form a hydrophobic, fatty moat around a cell that serves as a general gatekeeper, much in the way that your skin does for you. Charged particles cannot simply slip across this fatty moat because they can’t interact with it. And to keep the fat fluid, one tail of each phospholipid has that little kick, giving the cell membrane a fluid, liquidy flow and keeping it from being solid and unforgiving at temperatures in which cells thrive. Steroids: Here to Pump You Up? Our final molecule in the lipid fatty trifecta is cholesterol. As you may have heard, there are a few different kinds of cholesterol, some of which we consider to be “good” and some of which is “bad.” The good cholesterol, high-density lipoprotein, or HDL, in part helps us out because it removes the bad cholesterol, low-density lipoprotein or LDL, from our blood. The presence of LDL is associated with inflammation of the lining of the blood vessels, which can lead to a variety of health problems. But cholesterol has some other reasons for existing. One of its roles is in the maintenance of cell membrane fluidity. Cholesterol is inserted throughout the lipid bilayer and serves as a block to the fatty tails that might otherwise stick together and become a bit too solid. Cholesterol’s other starring role as a lipid is as the starting molecule for a class of hormones we called steroids or steroid hormones. With a few snips here and additions there, cholesterol can be changed into the steroid hormones progesterone, testosterone, or estrogen. These molecules look quite similar, but they play very different roles in organisms. Testosterone, for example, generally masculinizes vertebrates (animals with backbones), while progesterone and estrogen play a role in regulating the ovulatory cycle. Double X Extra: A hormone is a blood-borne signaling molecule. It can be lipid based, like testosterone, or short protein, like insulin. As you progress through learning biology, one thing will become more and more clear: Most cells function primarily as protein factories. It may surprise you to learn that proteins, which we often talk about in terms of food intake, are the fundamental molecule of many of life’s processes. Enzymes, for example, form a single broad category of proteins, but there are millions of them, each one governing a small step in the molecular pathways that are required for living. Amino acids are the building blocks of proteins. A few amino acids strung together is called a peptide, while many many peptides linked together form a polypeptide. When many amino acids strung together interact with each other to form a properly folded molecule, we call that molecule a protein. For a string of amino acids to ultimately fold up into an active protein, they must first be assembled in the correct order. The code for their assembly lies in the DNA, but once that code has been read and the amino acid chain built, we call that simple, unfolded chain the primary structure of the protein. This chain can consist of hundreds of amino acids that interact all along the sequence. Some amino acids are hydrophobic and some are hydrophilic. 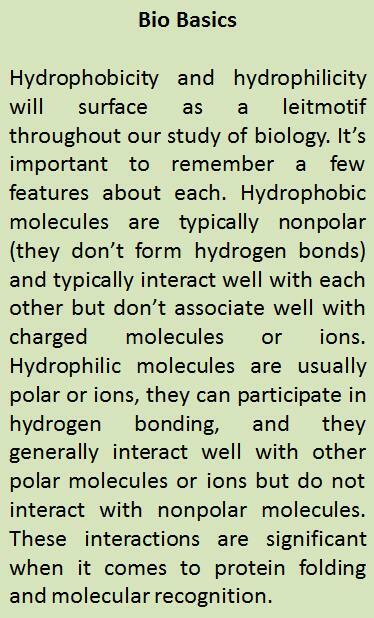 In this context, like interacts best with like, so the hydrophobic amino acids will interact with one another, and the hydrophilic amino acids will interact together. As these contacts occur along the string of molecules, different conformations will arise in different parts of the chain. We call these different conformations along the amino acid chain the protein’s secondary structure. 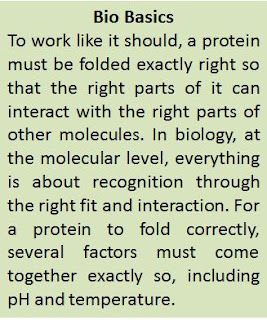 Once those interactions have occurred, the protein can fold into its final, or tertiary structure and be ready to serve as an active participant in cellular processes. To achieve the tertiary structure, the amino acid chain’s secondary interactions must usually be ongoing, and the pH, temperature, and salt balance must be just right to facilitate the folding. This tertiary folding takes place through interactions of the secondary structures along the different parts of the amino acid chain. 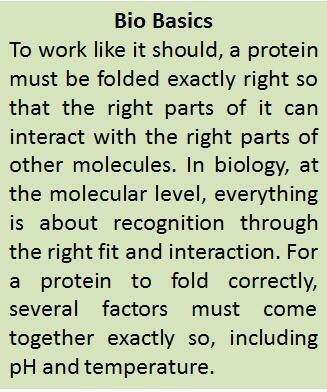 The final product is a properly folded protein. If we could see it with the naked eye, it might look a lot like a wadded up string of pearls, but that “wadded up” look is misleading. Protein folding is a carefully regulated process that is determined at its core by the amino acids in the chain: their hydrophobicity and hydrophilicity and how they interact together. In many instances, however, a complete protein consists of more than one amino acid chain, and the complete protein has two or more interacting strings of amino acids. A good example is hemoglobin in red blood cells. Its job is to grab oxygen and deliver it to the body’s tissues. A complete hemoglobin protein consists of four separate amino acid chains all properly folded into their tertiary structures and interacting as a single unit. In cases like this involving two or more interacting amino acid chains, we say that the final protein has a quaternary structure. Some proteins can consist of as many as a dozen interacting chains, behaving as a single protein unit. What does a protein do? Let us count the ways. Really, that’s almost impossible because proteins do just about everything. Some of them tag things. Some of them destroy things. Some of them protect. Some mark cells as “self.” Some serve as structural materials, while others are highways or motors. They aid in communication, they operate as signaling molecules, they transfer molecules and cut them up, they interact with each other in complex, interrelated pathways to build things up and break things down. They regulate genes and package DNA, and they regulate and package each other. As described above, proteins are the final folded arrangement of a string of amino acids. One way we obtain these building blocks for the millions of proteins our bodies make is through our diet. You may hear about foods that are high in protein or people eating high-protein diets to build muscle. When we take in those proteins, we can break them apart and use the amino acids that make them up to build proteins of our own. How does a cell know which proteins to make? It has a code for building them, one that is especially guarded in a cellular vault in our cells called the nucleus. This code is deoxyribonucleic acid, or DNA. The cell makes a copy of this code and send it out to specialized structures that read it and build proteins based on what they read. As with any code, a typo--a mutation--can result in a message that doesn’t make as much sense. When the code gets changed, sometimes, the protein that the cell builds using that code will be changed, too. Biohazard!The names associated with nucleic acids can be confusing because they all start with nucle-. It may seem obvious or easy now, but a brain freeze on a test could mix you up. You need to fix in your mind that the shorter term (10 letters, four syllables), nucleotide, refers to the smaller molecule, the three-part building block. The longer term (12 characters, including the space, and five syllables), nucleic acid, which is inherent in the names DNA and RNA, designates the big, long molecule. DNA and its nucleic acid cousin, ribonucleic acid, or RNA, are both made of the same kinds of building blocks. 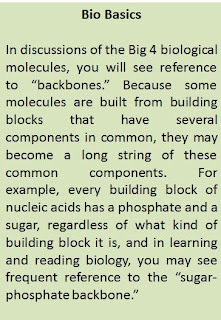 These building blocks are called nucleotides. Each nucleotide consists of three parts: a sugar (ribose for RNA and deoxyribose for DNA), a phosphate, and a nitrogenous base. In DNA, every nucleotide has identical sugars and phosphates, and in RNA, the sugar and phosphate are also the same for every nucleotide. So what’s different? The nitrogenous bases. DNA has a set of four to use as its coding alphabet. These are the purines, adenine and guanine, and the pyrimidines, thymine and cytosine. The nucleotides are abbreviated by their initial letters as A, G, T, and C. From variations in the arrangement and number of these four molecules, all of the diversity of life arises. Just four different types of the nucleotide building blocks, and we have you, bacteria, wombats, and blue whales. RNA is also basic at its core, consisting of only four different nucleotides. In fact, it uses three of the same nitrogenous bases as DNA--A, G, and C--but it substitutes a base called uracil (U) where DNA uses thymine. Uracil is a pyrimidine. An interesting thing about the nitrogenous bases of the nucleotides is that they pair with each other, using hydrogen bonds, in a predictable way. An adenine will almost always bond with a thymine in DNA or a uracil in RNA, and cytosine and guanine will almost always bond with each other. This pairing capacity allows the cell to use a sequence of DNA and build either a new DNA sequence, using the old one as a template, or build an RNA sequence to make a copy of the DNA. These two different uses of A-T/U and C-G base pairing serve two different purposes. DNA is copied into DNA usually when a cell is preparing to divide and needs two complete sets of DNA for the new cells. DNA is copied into RNA when the cell needs to send the code out of the vault so proteins can be built. The DNA stays safely where it belongs. RNA is really a nucleic acid jack-of-all-trades. It not only serves as the copy of the DNA but also is the main component of the two types of cellular workers that read that copy and build proteins from it. At one point in this process, the three types of RNA come together in protein assembly to make sure the job is done right. This material originally appeared in similar form in Emily Willingham's Complete Idiot's Guide to College Biology.